Marie Curie Cancer Care was delighted that Richard O'Brien decorated this ostrich egg to help raise funds for the charity. This unique opportunity to own an original piece of artwork by Rocky Horror creator Richard O'Brien went up for auction in April 2004. 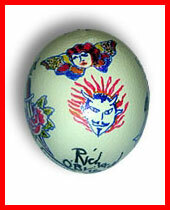 The Egg raised £50 towards the charity, thanks to everyone that placed a bid. Placing a Marie Curie Nurse in the home of a patient terminally ill with cancer for just one shift gives a family a much needed rest, knowing their loved one is in safe hands. Every every £15 paid for this unique piece of Rocky Horror memorabilia pays for 1 hours nursing. This service is provided totally free and is invaluable to those who receive it. If you wish to know more about Marie Curie Cancer Care or make a donation please click here to visit their web site.